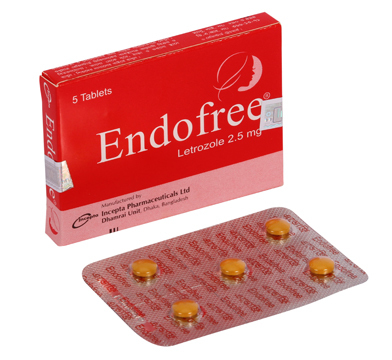 Endofree: Each tablet contains Letrozole BP 2.5 mg.
Letrozole is a nonsteroidal aromatase inhibitor. It exerts its antitumor effect by depriving estrogen-dependent breast cancer cell of their growth stimulus. Letrozole inhibits the aromatase enzyme by competitively binding to the heme of the cytochrome P450 subunit of the enzyme, resulting in a reduction of estrogen biosynthesis in all tissues. • Adjuvant treatment of postmenopausal women with hormone receptor positive early breast cancer. • Extended adjuvant treatment of early breast cancer in postmenopausal women who have received 5 years of adjuvant tamoxifen therapy. • First-line treatment of postmenopausal women with hormone receptor positive or hormone receptor unknown locally advanced or metastatic breast cancer. • Treatment of advanced breast cancer in postmenopausal women with disease progression following antiestrogen therapy. The recommended dose is one 2.5 mg tablet administered once a day, regardless to meals. In patients with advanced disease, treatment with Endofree® tablet should be continued until tumor progression is evident.Treatment should be discontinued at tumor relapse. No dosage adjustment is required for patients with renal impairment if creatinine clearance is 10 ml/min. No dosage adjustment is recommended for patients with mild to moderate hepatic impairment. The dose of Endofree® in patients with cirrhosis and severe hepatic dysfunction should be reduced by 50%. The recommended dose for such patients is 2.5 mg administered every other day. Letrozole is generally well tolerated. The observed adverse reactions are mild or moderate in nature including hot flashes, night sweats, weight increase, nausea, vaginal bleeding & irritation, endometrial proliferation disorders etc. Since fatigue and dizziness have been observed with the use of Letrozole and somnolence was uncommonly reported, caution is advised when driving or using machinery. During pregnancy: Letrozole is contraindicated during pregnancy. During lactation: Letrozole is contraindicated during lactation.